Despite fears of slow economic growth and a reduction in rentals in the commercial property sector, Greater London's property market has remained stable throughout 2012, with few major dips or swells. However, with foreign investors making up a huge 65% of commercial property buyers in Greater London, the question as to whether they will continue buying here when overseas estates are far more attractively priced remains. The first quarter of 2012 saw worry over the UK's economy, reflected clearly in the lack of risks being taken in the property market. As the EU directed almost a trillion euro into the banking system, these fears abated slightly. However, with investment values in commercial property at £6.85 billion, there was only a very slight increase - of 0.7% - compared to that of the last quarter of 2011. Greater London remains the giant in the commercial property buying sector - at 61% of the quarterly total, it is almost double the ten-year average of 35%. Of the top ten purchases in the first quarter of 2012, eight were made by foreign investors. Indeed, 40% of the total investment made during this quarter was made by foreign bodies. Save for properties with a value under £10 million, investors from overseas drive the UK's investment market. The market for properties worth under £10 million is dominated by UK investors, with institutions the biggest buyers. Compared to the first quarter of 2011, the number of new serviced office tenants (SOTs) decreased by 11% while the number of workstations for each SOT also decreased by 0.2. Prices of workstations increased to £321 from £294 per month. Greater London also dominated investments in the second quarter, taking in a massive 56% of the quarterly total - in monetary terms, around £4.4 billion. Most of this capital was invested in commercial office properties: there was an increase during the second quarter of 8%. Most of these purchases were made by investors from overseas looking for a base in London. The Olympic Games are thought to have had a positive effect on property sales during the second quarter of 2012 as investor demand in both Greater and Central London increased in this time. However, in the third quarter of 2012 - when the Olympic Games actually took place - commercial property investment deal sizes increased unexpectedly. It was thought that deal sizes would either decrease or remain stable. The average size of a property deal moved from £15.5 million to £22.5 million. A decrease of 28% in the number of deals completed was also noted during this quarter. During this third quarter, demand for commercial offices decreased by 7%. This still averaged out at an increase of 1% compared to the same time the previous year in commercial property purchases. 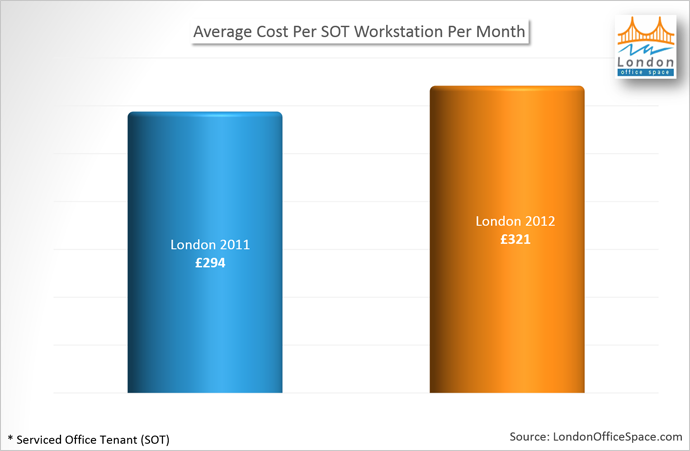 The number of new SOTs increased by 10% compared to 2011, while the volume of workstations decreased from 4.8 to 4.4 in Greater London. Average license lengths decreased from 7.8 to 7.3 months. The weekly price of these workstations, however, increased from an average of £283 to £333. Rental growth in the last quarter of 2012, though remaining steadily growing, has slowed down across the globe. Despite this, purchases made in the UK this quarter were mainly in London, with 46% of all investments this quarter happening there. The fourth quarter of the year saw a decrease in investment by home bodies by some 50%: medium sized deals, usually dominated by home investors, decreased this quarter to 85 compared to 125 during the third quarter. Overseas investment, however, was seen to increase from £2.28 billion in the last quarter to £3.57 billion.